In addition to African Mahogany, Sapele and Utile (a.k.a. Sipo) are excellent alternatives to the increasingly elusive high-quality Genuine Mahogany we all once knew and loved. These cousins are often confused for one another, and both provide excellent choices for woodworkers seeking a replacement for Genuine Mahogany. 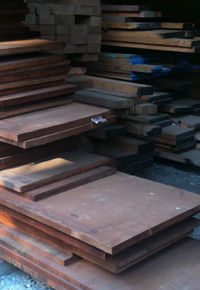 Sapele and Utile both hail primarily from Cameroon, the Congo, Ghana, and The Ivory Coast. While they also grow in other areas of the continent, those areas listed provide the infrastructure required to effectively harvest and saw the lumber as well as to dry it in preparation for shipment. Both Sapele and Utile trees are large, hearty trees with large, straight central trunks, or boles. Because they grow in canopy forests, the trees need to grow toward the sun, which means they grow few low-hanging branches; this growth tendency results in few irregular grain patterns or knots. In addition, the sapwood layer is both thin and creamy white, providing a beautiful contrast to the deep reddish brown heartwood. Many woodworkers agree that Utile and Sapele are enjoyable to work with, and their beauty makes any challenges well worth your while. The interlocking grain spirals around the tree in a way that hints at the double helix pattern of a DNA strand. This intriguing grain pattern makes planing without tear out difficult — much more so than African Mahogany. When it comes to hardness, Sapele is actually harder than Hard Maple, with a Janka rating topping 1500. At just over 1200, Utile is a little easier on edge tools. As already mentioned, these two species are often mistaken for one another. 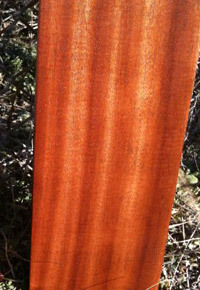 Sapele, the better known of the two, is highly prized for its parallel ribbon striping when quarter sawn; as a result, it is often used for plywood veneer. Utile has similar striping, but it’s not as parallel and has wider and more subtle ribbons of color; however, flat sawn Utile displays larger pore structure as attractive dark lines between growth rings. Both species show off a rich, reddish color and extremely straight grain, and quartersawn cuts provide the addition of stunning figure to the wood. 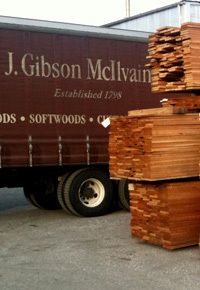 Due to their stability, Sapele and Utile are both widely used as exterior species and used commercially in doors, windows, and exterior trim. While both can be used for plywood veneer, Sapele is far more popular for that use (and when Utile is used, it is likely being mistaken for Sapele!). Many furniture makers appreciate both of these species, and some claim that Utile, in particular, beats out Genuine Mahogany in its beauty, its working characteristics, and its durability. 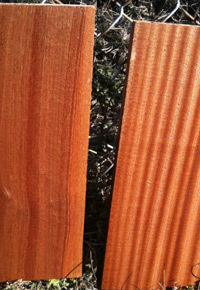 The dark lines that appear on the face of flat-sawn Utile add distinctive character to this already gorgeous species. According to some reports, much of the furniture made during the “golden age” of furniture during the 1700s was actually made from Utile, rather than Genuine Mahogany as many people assume.